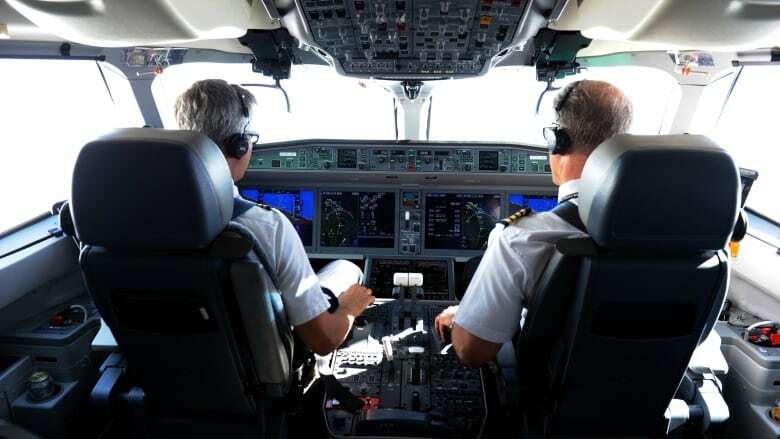 NewTransport Canada to scale back government oversight of commercial pilot testingStarting this fall, people hired by the airlines to evaluate the competence of Canada's commercial pilots will be subject to less direct oversight from Transport Canada. Starting this fall, people hired by the major airlines to evaluate the competence of Canada's commercial pilots will be subject to less direct oversight from Transport Canada. The government says the move will free up important resources, and the industry says it&# 039;s up to the task. But critics warn it could compromise safety. "Public safety is inevitably going to be challenged by corporate priorities," said Greg Holbrook, director of operations with the Canadian Federal Pilots Association, the union representing 450 government aviation inspectors. In order to maintain their credentials, pilots must regularly undergo what is known as a "Pilot Proficiency Check," which tests their abilities under regular and emergency flying conditions. Depending on how long they've been flying, they may have to qualify once a year or once every few years. The tests are administered by both Transport Canada and independent operators who have been approved by the department. Transport Canada has traditionally monitored the independent evaluators, but CBC News has learned the major airlines will begin overseeing their own tests this fall. Transport Canada inspectors will be less involved in ensuring those who are testing and signing off on Canada's pilots are up to par. Instead, the department will delegate that role to "senior" private evaluators and spend more time reviewing the major airlines' pilot safety paperwork. If industry is left alone to ensure its evaluators are following the rules, it could lead to conflicts of interest, Holbrook warns. 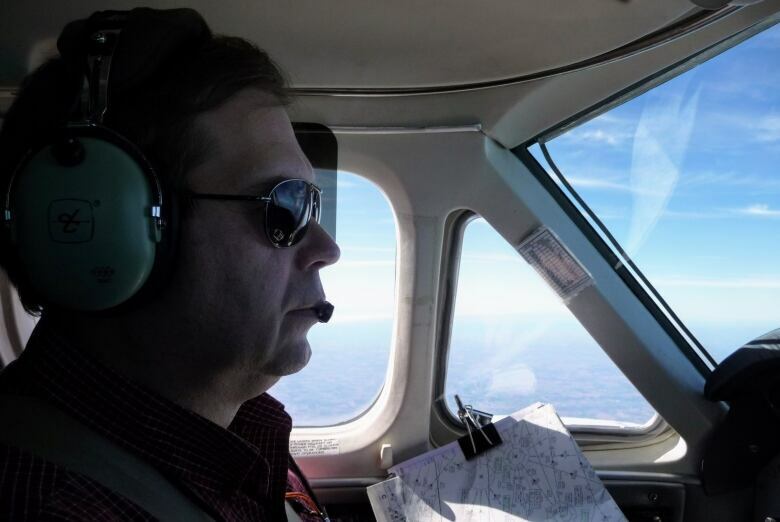 As an example, he described how an evaluator conducting a pilot proficiency check on a peer might feel internal pressure, perhaps because o f a flight-scheduling issue, to pass their colleague, even if they didn't quite meet the standard. "Do I have to satisfy Transport Canada, or do I go along with what my boss wants, who pays my paycheck, and pass the guy?" he said. Transport Canada's own risk assessment last year found that implementing the new system would result in "a further erosion" of its ability to keep an eye on how the industry polices itself. John McKenna, president of an industry group called the Air Transport Association of Canada, said the airlines have long been calling for these changes. He said staff at Transport Canada " ;just don't have the resources" for on-site test evaluations. "The people doing this for industry are much more frequent flyers and pilots than [Transport Canada] inspectors," he said. As for any safety concerns, he said, "there's no way" the professionalism of the industry's pilot evaluators should be contested. Transport Canada has shared pilot-testing duties with the airlines for the past 25 years. 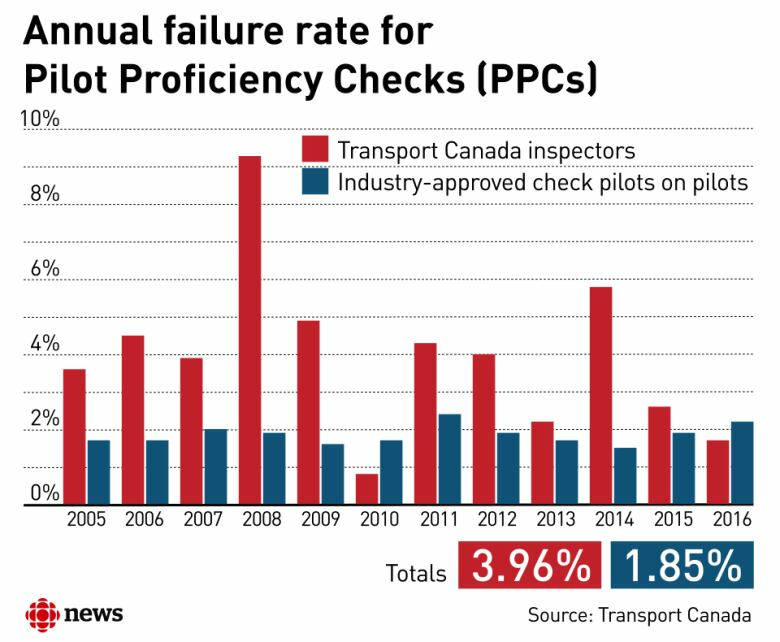 In the last year, Transport Canada inspectors performed 300 pilot proficiency checks compared to 15,000 by industry-employed testers. The checks test a variety of skills in various stages of flight including taxiing, takeoff and landing, as well as during several complex emergency situations. The failure rate among professional pilots is very low. Still, Transport Canada data released earlier this year shows pilots who w ere tested by department inspectors failed at a higher rate than those tested by approved evaluators employed by the industry. Transport Canada said it's not unusual to see a higher failure rate when pilots are evaluated by its inspectors. The department told CBC News that "higher stress levels and performance pressures" are often to blame when a Transport Canada inspector is in the cockpit. Under the new rules, only experienced pilot evaluators will monitor other evaluators, Transport Canada said. And the department will supervise each new evaluator's first pilot proficiency check. NDP MP Robert Aubin said he is concerned about Transport Canada's decision to scale back its on-site scrutiny of pilot evaluators. In an email statem ent to CBC News, he said Transport Minister Marc Garneau "must back down on his decision and not give direct oversight of the pilots only to the airlines." He said he doesn't think the move "will improve the confidence of passengers in air safety." Conservative transportation critic Kelly Block said the Canadian airline industry has a strong reputation for safety, but the need for proper oversight is critical. "One catastrophic accident could destroy that reputation and severely harm Canada's airline industry," the MP from Saskatchewan said. Transport Minister Marc Garneau was not available for an interview.